Crowd-sourced Public Dataset Lifecycle Ontology.Dacura support ontology.Crowd-sourced Public Dataset Lifecycle Ontology. Crowd-sourced Public Dataset Lifecycle Ontology. This ontology is used to describe the domain-specific extensions to the ALIGNED data lifecycle model ontology (DLO) and software lifecycle ontology (SLO) for crowd-sourced public datasets based on the DBpedia use case within the ALIGNED project. Over time generic features may be migrated to the upper ontology. The current scope of this ontology is to support extensions needed for DBpedia scenarios within Phase 2 of the ALIGNED project. Thus there is a focus on the validation activities. DBpedia is a large-scale extraction project of unstructured & semi-structured data from different Wikipedia language editions to RDF. This extraction is achieved from a modular extraction framework that is customized to handle multilingualism and structural differences between different Wikipedia language editions. The latest DBpedia release (v. 2016) generated a total of three billion facts from 125 localized versions. As Wikipedia evolves over time the code should be able to adapt to these changes. However, identifying errors at this data scale becomes very hard and validation workflows must be established that will ensure the quality of the extracted data. ALIGNED is tackling these challenges with data validation and interlink validation tools that communicate their results though the ALIGNED vocabularies. Running the extraction framework for the actual extraction of data from Wikipedia. Running checks and enhancements to the data generated by the DBpedia extraction framework before publishing. Releasing a DBpedia dataset is a complex procedure that involves a lot of pre-processing steps performed before the actual extraction of data from Wikipedia. Releasing a DBpedia dataset is a complex procedure that involves a lot of pre-processing steps, the actual extraction, additional postprocessing steps and finally the dataset publishing step. 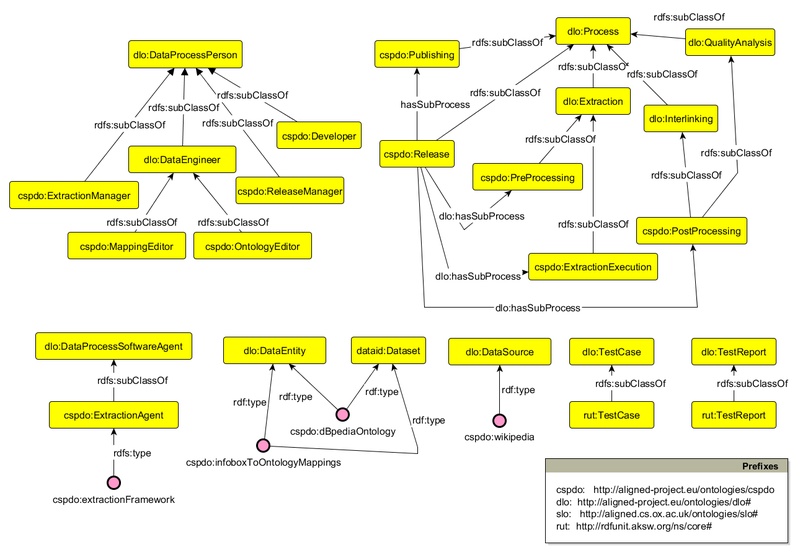 This activity is performed by the release manager using the extraction framework and DBpedia tools. Publishing a new DBpedia release on the web. DBpedia team members who run the extraction process for a given DBpedia release. Software agents that perform the extraction such as DBpedia live. Community members who edit the DBpedia mapping wiki. DBpedia foundation members that edit the DBpedia ontology. DBpedia team members that are responsible for the actions leading to a given release of DBpedia. The source code used to extract knowledge from Wikipedia. Crowdsourced OWL ontology describing DBpedia concepts and properties. Crowdsourced mappings between the DBpedia ontology and Wikipedia infoboxes. The original input source for DBpedia.